The following is the opening chapter – in te reo Māori followed by English – from the new Te Papa Press book that accompanies our iwi exhibition, Ko Rongowhakaata: The Story of Light and Shadow, which marks its first anniversary today. Ka heke ngā iwi o Tūranganui-a-Kiwa i te tāhū whakapapa o te tipuna, o Te Wairuapani-o-te-Ora. Ko Rongowhakaata tētahi o ngā rangatira o ērā wā. Nāna hoki ngā tamāhine a Moeahu i moe. Nō tērā wā, ā, ki mohoa noa nei ka ora ngā kōrero me ngā tikanga i roto i ngā hapū o Ngāti Kaipoho, Ngāti Maru, o Ngāi Tāwhiri hoki. Ko ngā iwi o Ngāi Tāmanuhiri, o Rongowhakaata, o Te Aitanga-a-Māhaki te ahikāroa o te whenua, o te moana, o ngāi tipu, o ngāi kīrehe i Tūranganui-a-Kiwa. He pekanga nui tēnei whakaaturanga nō te rākau whakatipu i te iwi o Rongowhakaata. Nō muri iho i te noho roa ki te rangiruatanga, ki ngā take taukumekume, ki ngā kerēme mō Te Tiriti o Waitangi, kua tīmata te taupiki o te tōnui, o te ora o te iwi. Ko tā te whakaaturanga he ruku i te kore, i te pō i roto i a mātau, ā, ka whakawhitia ake ki te whai ao, ki te ao mārama. Tihei mauri ora ki a Rongowhakaata! I tipu ake, i rea ake tēnei whakaaturanga i te whakaaro, arā, ko wai a Rongowhakaata, ā-tīpuna, ā-iwi nei, ā-mātauranga nei, ā-ao nei. I hauhaketia te oneone mō te whakaaturanga nei e ngā whānau, e ngā hapū. Nā rātau ā rātau kōrero, ā rātau rau puiaki i hari mai ki ngā marae e rima o Rongowhakaata. Nā ngā whakakitenga a tēnā marae, a tēnā marae ka kitea te mana motuhake o ia whānau, o ia hapū nō ngā marae. Inā te whānuitanga o ngā korero, o ngā mahi toi. Nō muri mai i tērā, i huri te aroaro o te whakaaro ki te whakarite i ngā toi kōrero hei kai mā ngā mata o te rohe whānui o Te Tairāwhiti. Ka mutu, i whakatūria te whakaaturanga rā o Rongowhakaata: ‘Te Kotahi nā Tūrāhiri’ ki te whare taonga o Te Tairāwhiti. Ka tū Ko Rongowhakaata ki Te Papa. Ko te pūāwaitanga tēnei o ngā whakaaturanga ki te motu, otirā, ki te ao whānui. He mahi tapatahi tēnei me Te Papa, ā, ko te tuawaru hoki o ngā whakaaturanga ā-iwi ka tū ki reira. Ko Te Hau ki Tūranga me tōna papa whenua i Rongowhakaata. Ko tō mātau whare whakairo, anō he pou whenua, he tūāhu whakaahurewa mō te iwi. Ka mutu, he whare whakaihiihi, he whare whakaohooho i te ira toi atua, i te ira toi tipuna e rere ana i te toto o ngā uri o Rongowhakaata. A view linking Te Hau ki Tūranga with imagery of the landscape of Rongowhakaata’s rohe. Our whare whakairo exemplifies the influence of places and stories that resonate for us. Its artistry inspires us to continue that unique thread of innovation and skill in all spheres of creative expression associated with being Rongowhakaata. He rangaranga whakaaro, he hokinga mahara mō te wāhi e tū ana te whakaaturanga nei. Kua roa noa atu te noho a tō mātau whare whakairo, a Te Hau ki Tūranga i ngā ringaringa o ētahi atu. Kua hipa te kotahi rau, e rima tekau tau i tāhaetia ai tēnei taonga nui whakaharahara nō Rongowhakaata. Ko tā te whakaaturanga, he tohu ōkawa ki te ao mō te hokinga mai o te whare tipuna ki ōna uri. Ko tāna anō, he huarahi hei whakarenarena i ngā taura here i waenga i te kairapu taonga me te kāhui mahinga toi. He tika hoki, he oranga ngākau, he pikinga wairua. Ko te anga whakamua, ko te whakarauoratanga. Ko te whakahounga o te whare tahito tērā, ko te tuituinga o ngā uri ki ōna pakitara kōrero tērā, ā, ko te whakaohonga o te kura auaha e huna ana i roto i ngā whakareanga i heke mai i tēnei whare. Mō te whakaaturanga Ko Rongowhakaata, he matapihi ia ki te ao o Rongowhakaata, he iwi nui tonu nō roto mai i Tūranganui-a-Kiwa, i Te Tairāwhiti, otirā, i Te Ika-a-Māui. Hei tēnei whakaaturanga, ka kitea rawatia ētahi o ngā taonga kāmehameha nō tuawhakarere mā, me ngā toi auaha nā ngā ringa rehe o nāianei. Kua pihi ake ngā torotoro o tēnei whakaaturanga i ngā one taketake me ngā wāhi hirahira o Rongowhakaata. Kua whekuwheku mātau ki ngā wai parapara o tua nehe mā, ā, ka kitea iho te tōtika o te tipunga rākau e kīia nei ko Rongowhakaata. Nā reira e hika mā, tomo mai ki te ao o Rongowhakaata, he herenga kōrero a runga, he piringa tangata a raro. Ruku i te pō! Ruku i te ao! Ka tīmata tēnei whakaaturanga i te orokohanga rā anō, arā, nō te kore, nō te pō ka puta ki te whai ao, ki te ao mārama. He kupu whakarite ia mō te iho pūmanawa i roto i a tāua te tangata. Ko te whakawhitinga o te rā i ngā pārae o tō mātau kāinga, i Tūranga, te whakakikotanga o ēnei kupu. Ka puea ake te ihi rangaranga i roto i ngā uri, i ngā ringa toi hoki o Rongowhakaata he pāhekoheko nō ngā mahi a Tamanui te rā me te whenua, te rangi, te moana hoki. Ko te ao me te pō, he kupu whakarite ia mō ngā pikitanga me nga hekenga i waenga i a Rongowhakaata. Ka ngana tonu mātau ki te hāpai i tō mātau iwitanga i roto i ngā iwi o Tūranga. Kāti, he iwi kua aupēhia, kua takahia, kua pōhara i te mahi a ētahi atu, ā, koia ko te noho i te pō. Hoi, hei tēnei whakaaturanga ka kitea te putanga o Rongowhakaata i te pō ki te ao mārama. Ki te wewete mārire i te ingoa o Rongowhakaata, e rua ngā āhuatanga ka puta. Ko te ‘rongo’ — he tuku i te wairua kia rere, me te ‘whakaata’, he whakaatu i ō kitenga. Ko te whakatinanatanga me te auahatanga o te whakaaro tēnei. Ko Te Hau ki Tūranga te pou tokomanawa mō te whakaaturanga. Mai a runga, mai a raro kei tēnei whare te toi o ngā kōrero, mō ngā hītori o Rongowhakaata, he kōrero nō te pō hei whakawhitinga i te ao. Ko ‘Te Poho o Rongowhakaata’, ko te urunga matua tēnei ki te whakaaturanga. Ka riro māna ngā whare e rua, tērā nō Te Papa, arā, ko Te Hono ki Hawaiki me te whare whakairo o Rongowhakaata, arā, ko Te Hau ki Tūranga te tūhonohono. Ko tāna, he whakamānawa i ngā kāwai whakapapa ki a Tuanehe mā, ka tahi. Ka rua, ko tō mātau Rongowhakaatatanga. 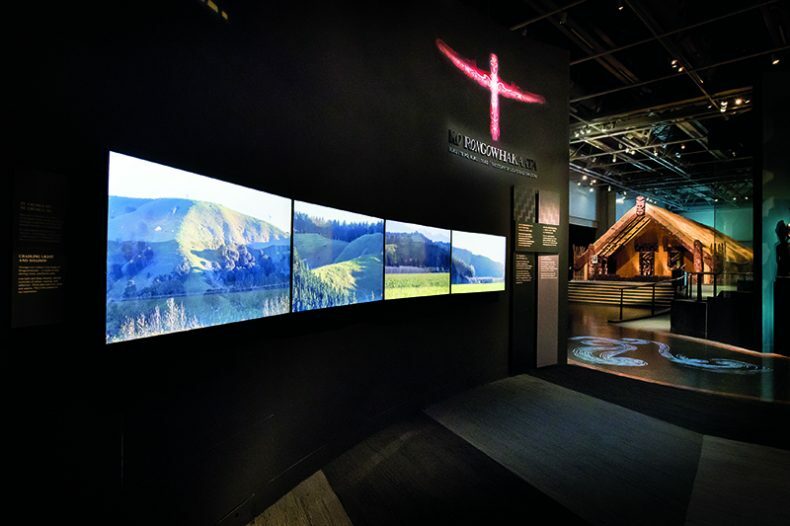 ‘Te Poho o Rongowhakaata’, the main exhibition entrance and the linking space between two houses and their marae — Te Papa’s Te Hono ki Hawaiki (the link with Hawaiki) and our carved tribal house Te Hau ki Tūranga. The space celebrates our ancestral connections and reinforces our unique identity as Rongowhakaata. The major whakapapa of the people of Tūranganui-a-Kiwa descends from the tipuna Ruapani. His contemporary, Rongowhakaata of Ūawa, enjoined with three sisters thus creating a continuum that forms the histories and customs of the contemporary hapū of Ngāti Kaipoho, Ngāti Maru and Ngāi Tāwhiri. Along with the neighbouring iwi of Ngāi Tāmanuhiri and Te Aitanga a Māhaki, the present Rongowhakaata are the authority over the lands, the waters and the flora and fauna of Tūranganui-a-Kiwa. Ko Rongowhakaata is part of a pivotal development for our people, the iwi Rongowhakaata. After a long period of uncertainty, of unresolved issues and Treaty of Waitangi claims, we have entered a time of consolidation and innovative development. The story we present is symbolic of emergence, unfolding and the rediscovery of our own uniqueness. The exhibition evolved from a programme aimed at building a revitalised sense of Rongowhakaata identity. What does it mean to belong to this iwi? Who are Rongowhakaata? What is the essence of our experience and knowledge? In the programme’s first phase, whānau and hapū prepared the ground, bringing their stories and treasures to our five marae. These five exhibitions, each developed from the distinctive perspectives of Rongowhakaata hapū, gave expression to the diversity of our stories and creativity. They laid the foundation for the second phase where we collectively shaped the presentation of our overall story to the wider region, the north-eastern seaboard of the North Island, at Gisborne’s Tairāwhiti Museum. 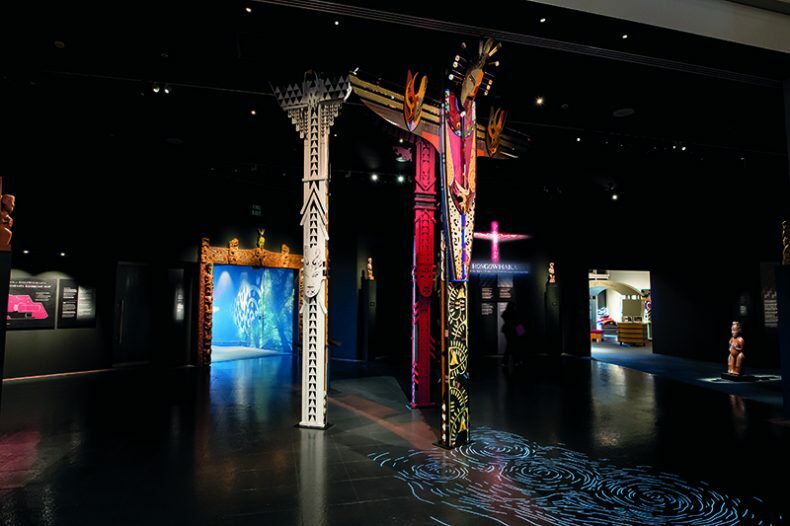 Ko Rongowhakaata at Te Papa is the third phase of the programme, in which we have brought our taonga and stories and the continuing expressions of our artistry to share with Aotearoa and a global audience. Developed in collaboration with the museum, it is the eighth iwi exhibition to be held at Te Papa. He tirohanga atu ki ‘Ngā ripo’, arā, he wāhi hei whakairinga toi o nāianei i te whakaaturanga. Ko te pou hangā ki te karāhe nā Simon Lardelli. Ko tōna kaupapa, he rāwekeweke i ngā terenga a Tamanui, he whakamiha hoki ki te mahi a ngā ringatoi o Rongowhakaata, arā, he ringa tohutohu i te ao, i te pō. Ko tā Matt Randall mahi, ko te pou tokomanawa o Ruapani. Ko tōna kaupapa, rangiwhāwhā ana te toro o te kupenga a tēnei tipuna rongonui hei paiherehere i te tangata. View of ‘Ngā ripo’ (the ripples), a gallery featuring contemporary artworks within the exhibition. Simon Lardelli’s glass pou plays on positive and negative space, paying homage to Rongowhakaata’s fame as ‘carvers of light and shadow’. Matt Randall’s poutokomanawa Ruapani acknowledges the unifying influence of this renowned and revered ancestor. There is a special poignancy and sense of regathering about the setting for the exhibition. Te Papa and its predecessor institutions have been the repository for our whare whakairo Te Hau ki Tūranga, a world treasure, which was stolen from us by rapacious collectors some 150 years ago. The exhibition embraces our official repossession of the house and reunites the descendants of this treasure’s creators with their legacy. Ko Rongowhakaata represents the shift to a positive dynamic in the developing relationship between collectors and creators. It also offers us a unique opportunity for restoration — of the house itself, altered almost beyond recognition during the period of separation; of severed links to the knowledge that the house embodies and represents; and of Rongowhakaata as an iwi, invigorating and extending our own skills and restating our creativity. Ko Rongowhakaata is a window into the world of Rongowhakaata, a prominent iwi from the Tūranganui-a-Kiwa (Gisborne) region of the north-eastern North Island, and one of some eighty acknowledged iwi groups in Aotearoa. In this exhibition we present some of our greatest treasures and heirlooms, stories and relationships of key significance to our people, along with highlights of our contemporary artistry. The exhibition illustrates our vital connections with our origins and places of significance. It tells of the influences that have shaped and continue to sustain who we are, and of the innovation and creativity that are essential to how we understand who we are. Welcome to the world of Rongowhakaata, a people of shared identity, with many voices, expressions and perspectives. Ruku i te pō, ruku i te ao. Delve into the dark, emerge into the light. Our story of light and shadow refers to both our experience and our environment. It begins with the origins of existence and creativity, in absorption in the unconscious and emergence into the conscious, in the dynamic relationship between intuition and expression. Its physical manifestation is Tūranga, our home area, most evident when the easterly sun is cradled within the landscape. The sharply contrasting play of light and shadow, of positive and negative, has influenced and inspired generations of Rongowhakaata people and artists. Light and shadow is also a metaphor for the dynamic contrasts of our story, reflecting the many polarities of establishing and maintaining our identity and our hold on our place in Tūranga: division and unity; disruption and adaptation; contest and compromise; conflict and reconciliation; severance and reconnection, among many others. Our tribal name itself, Rongowhakaata, can be seen as a dynamic pairing. It combines ‘rongo’, to open the senses, with ‘whakaata’, to show or reflect — describing the transition of thought to form: the elements of creation. 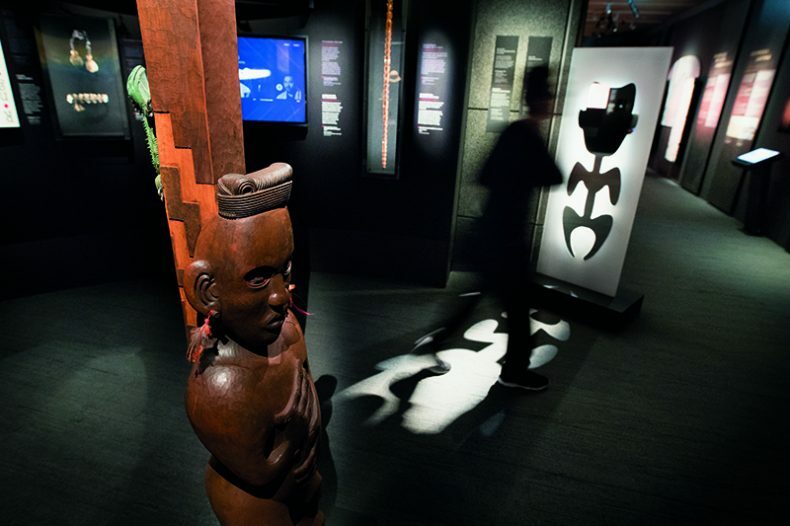 The central taonga in the exhibition, our carved house Te Hau ki Tūranga, embodies both these aspects of the story of light and shadow. It is a supreme example of our artistic accomplishment. It is also a reflection of some of the darkest days of our past. This book is published to mark the opening of the Ko Rongowhakaata: The Story of Light and Shadow exhibition at Te Papa, which represents the culmination and breadth of Rongowhakaata history and whakaaro (considerations) and has the significant meeting house Te Hau ki Tūranga as its central statement of identity and aspiration. The book showcases more than 60 Rongowhakaata taonga, and its text, in English and te reo Māori, focuses on key threads including innovation and kaitiekitanga (sustainable processes). It also explores layers of encounter within Tūranga – Rongowhakaata and Gisborne iwi first encountered the British in 1769, during Captain Cook’s arrival in Poverty Bay – and the impacts of those encounters on the shape and position of the iwi, and indeed modern New Zealand, today. Thank-you for making this available to me. Will read with my brekka.